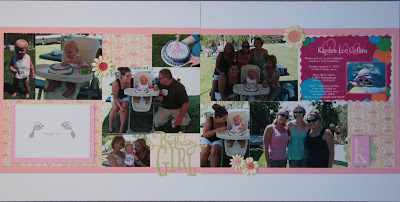 Back in August, my mom came out to visit and we went up to Sacramento for my cousin’s daughter’s 1st birthday party. It was a great mini reunion with my cousins, aunt, and mom. Details: Pink/yellow patterned paper is Two Scoops Dreamsicle by Basic Grey. ‘K’ chipboard accent is by Heidi Grace Bouquet. Journaling block behind ‘K’ is by K&Company. 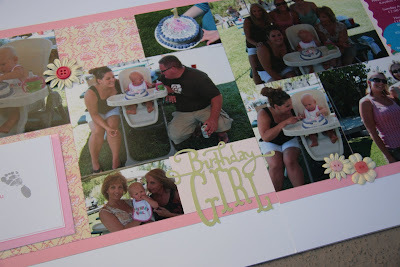 “Birthday Girl” was cut using the Storybook Cricut cartridge. Cute! I especially love the buttons.